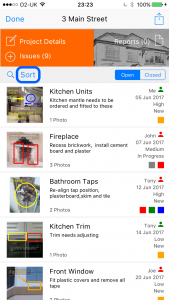 Site Report Pro allows you to sort your projects and issues to make it easier to find what you are looking for. 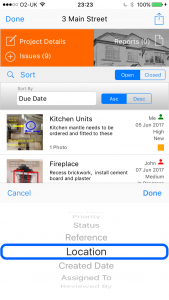 On the projects screen, click Sort. 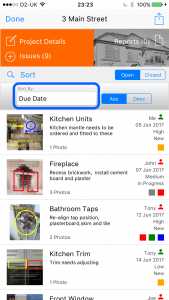 Click Sort By to display the list of attributes that projects can be sorted by (e.g. Status). 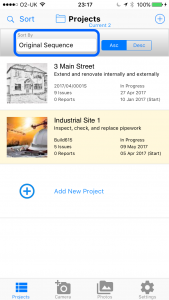 On the projects screen, click the required project. 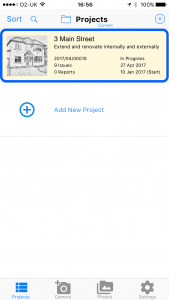 The project screen containing all the project issues will be displayed. Click Sort By to display the list of attributes that issues can be sorted by (e.g. Due Date). TIP: Click Asc or Desc to order the items in ascending or descending alphabetic order. 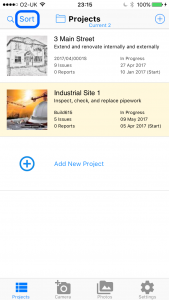 TIP: Projects that are no longer active can be moved to an Archive folder. 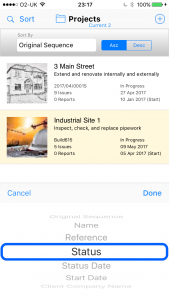 View the Archive Project article to learn how to do this.